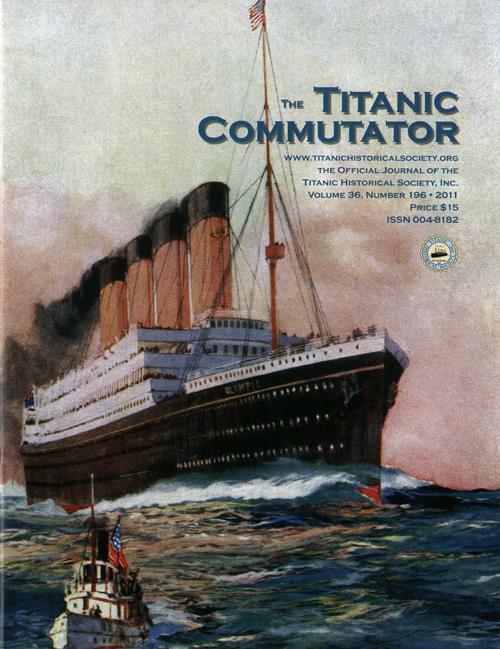 The Titanic Commutator, 4th Quarter 2011, Official Journal of The Titanic Historical Society, Inc. This issue features an article about four newspaperwomen who reported on the Titanic disaster. Other articles included a commentary on the Responsibility for the Titanic Disaster, The Oceanic HOuse of the White Star Line and information about the 2012 Titanic Historical Society Convention next April. FRONT COVER (at right) A striking illustration of Olympic steaming along near the end of her transatlantic voyage as a pilot boat stands by. The painting is by the noted maritime artist Charles Dixon. A couple of letters correcting the glass slide as Mauretania was Aquitania; what happened to Edith [Russell] Rosenbaum's pig?, what was it made of? ; a rivet from the Titanic? ; information on the final identification of the unknown child in Fairview Lawn Cemetery is available; questions on original findings of unknown child in same cemetery; questions about a deck chair purchased many years ago in South Australia. Top (Not Shown): At Oceanic	House, the basement full, the main booking hall overflows with passengers baggage as staff try to cope with high season demands. Middle Right (Not Shown): Katherine Hurd scratched out "Saxonia" on the stationery heading while aboard Carpathia describing the Titanic disaster. Bottom Right (Not Shown): Labeled "Titanic" the, Kaiser Wilhelm deGrosse postcard postmarked May 14, 1912 was the wrong ship, wrong company, and departure: 'Departure at Liverpool."